Trump may tap his emergency powers without reopening the government, a move some allies say could ‘screw’ Democrats. The warning came during Trump’s Thursday visit to the southern U.S. border, according to three sources with knowledge of those conversations. 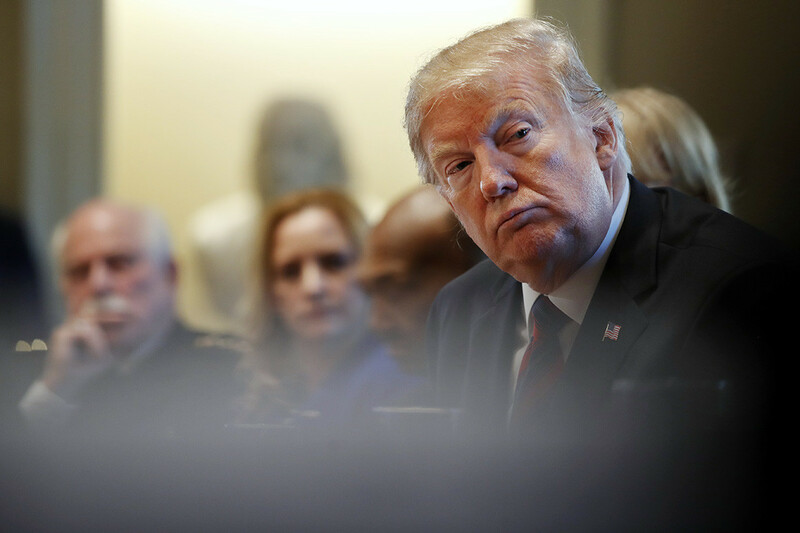 Many Democrats and some Republicans have grown hopeful that a national emergency declaration, which would allow Trump to tap Pentagon funds for a border wall, might end a political standoff that has partially shut down the government for three weeks. But Trump’s allies say the president is reluctant to hand Democrats a “win” by reopening the government after he’s invoked emergency powers. They claim that in such a scenario, Trump’s political opponents would avoid making a single concession and potentially score a major victory if the administration were to lose in federal courts as many legal experts predict. “He could say, ‘Look, I’m going to get what I want and then I’m still going to screw you,’” a former White House official told POLITICO. “It’s making Democrats feel pain instead of declaring a national emergency, opening the government up, and making it so they don’t have to give anything,” the former official added. Trump said on Thursday that he would “probably” use executive authority to build a border wall if Democrats won’t relent and provide funding for the project. On Friday, he said such a move wasn’t imminent — “What we’re not looking to do right now is national emergency,” Trump told reporters — even though the option remains under serious consideration inside the West Wing. The White House did not respond to a request for comment on Friday. And the move would infuriate Democrats, and even some members of the president’s own party, who oppose efforts to construct a barrier without congressional approval and want Trump to reopen the government as soon as possible. Talks between the White House and Democratic leaders collapsed mid-week when Trump walked out of his latest meeting with House Speaker Nancy Pelosi (D-Calif.) and Senate Minority Leader Chuck Schumer (D-N.Y.). Trump has held fast to his demand for $5.7 billion in funding for a wall, which he sometimes also calls a fence or barrier, while Democrats say they will not support a penny for the project. There’s no guarantee that Pelosi or Schumer would grow more open to a deal if the shutdown outlasts an emergency declaration. And Trump would likely also encounter opposition from within the Republican caucus, where some members have already raised concerns about the potential use of extreme presidential powers to bypass Congress and build a wall. “I think the president will have problems on his own side of the aisle for exploiting the situation in a way that enhances his power,” Pelosi said at a Thursday press conference. The National Emergencies Act of 1976 allows the president authority to invoke unusual legal powers at his discretion. The act has been invoked dozens of times over the past 40 years, including several times by Trump himself. Administration officials say that Pentagon accounts that Trump would access with emergency powers contain enough money to meet his $5.7 billion demand. Inside the White House, Trump has been consulting with advisers on the various paths forward and the impact an emergency declaration might have on his re-election bid. A majority of Americans — 51 percent — now blame the president for the shutdown, according to a Reuters/Ipsos poll released Tuesday, three days before hundreds of thousands of federal employees were scheduled to forego their usual paychecks. In a concern over the plight of the 800,000 federal workers who are missing paychecks — and perhaps also the political damage that comes with it — the Office of Management and Budget is working with payroll providers on a “special mid-cycle pay disbursement for impacted agencies” to ensure that employees are paid as fast as possible once the shutdown ends, according to a senior OMB official. Meanwhile, Trump’s son-in-law Jared Kushner is holding out hope that a bipartisan agreement can be struck. Kushner has been in near-constant contact with several GOP members. (“He is easily the best at returning my calls,” said one Republican congressman.) Kushner was pushing for a compromise involving the Deferred Action for Childhood Arrivals program as recently as Thursday afternoon. Some of Trump’s advisers are also saying that he can win the shutdown battle without invoking emergency powers by digging in for the long term and maintaining an aggressive message. Some fear that Trump’s conservative supporters — determined to see Congress bend to Trump’s will on a border wall — might see the use of emergency powers as a cop-out. Seeking to do just that, the president on Tuesday dined with anchors from several cable networks before describing a “growing humanitarian crisis” at the border during an Oval Office address in front of millions of Americans. On Thursday, Trump and an entourage that included Homeland Security Secretary Kirstjen Nielsen and White House counsel Pat Cippollone, met with immigration officials near an existing border barrier in McAllen, Texas. Outside advisers described Trump’s border trip as a positive step, but said he should now take his case around the nation, potentially by staging immigration-focused events in congressional districts that recently flipped from red to blue. Some also argue that Trump would benefit from agreeing to sign spending legislation immediately after declaring a national emergency. CORRECTION: This post has been update to correct the spelling of Kirstjen Nielsen’s name.